I have a son, John, who lives in Eugene, OR, about 60 miles away from me. He is self-employed as a More…hardwood floor installer. He is married and has two boys - ages 22 and 20. One in Navy and one in Boise, ID. I have a daughter, Julie, who lives in Portland, OR, about 3 hours from me. She is single with no children. She is also self-employed as a Blythe doll dress designer and creator. I moved to Oregon in 1966 and lived in Eugene until 1982 when my ex-husband and I traveled the United States for four years. We ended up in Florence, which is on the central Oregon coast and about 60 miles west of Eugene. We purchased a real estate company here in 1989 and I am still owner/operator although now my focus is on property management (thankfully not sales). I live across the street from the ocean and am daily greatful for that. I keep busy with my business, friends and family.UPDATE: Broke my ankle 1/21/10 and still walking slowly - no cane, though. Couldn't make it to the reunion because I couldn't drive that far. Much better now, driving but still walking slowly and taking it easy. It's only amazing to think it's been fifty-thre years!!!! How can that be - I still feel 18. I remember being on the Talisman staff and what fun that was, and being so over-joyed to finally graduate and get on with my real life. School was fun but life was better. 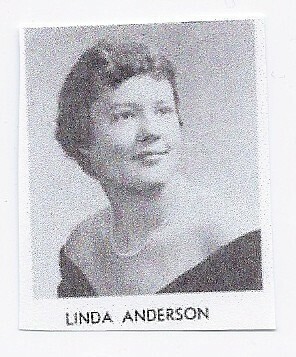 Linda Anderson Westphal has a birthday today. Linda Anderson Westphal changed "Now" picture. Linda Anderson Westphal added a comment on Profile. Linda Anderson Westphal posted a message. Hope you had a Happy Birthday and you are well and happy. Hi Stephen. Another year older, but still kicking. Have a great day. Linda Anderson Westphal posted a message. New comment added. Yes, I remember you. Glad to learn your still with us. I took French with Dr. Has and still happy to have the basics. Bon jour. Hi Carol. Happy Birthday. Hope your day is special. Happy birthday friend. Hope all is well. My son John and I.